Everyone is going to plan their menu a little bit differently — and that’s perfectly okay! What matters is that you do it, and that it works for your family. For the record, I’ve tried multiple menu-planning methods. Some have worked better than others and some have worked better for us in certain seasons than in other seasons. I always start by planning my menu around what I have on hand and what’s on sale at the store. I’ve found that freezer cooking definitely makes menu planning easier since it means you have meals already in the freezer ready to go. I also keep a running list of Recipes I Want to Try on a Pinterest Board. I always consult this when making our weekly menu plan to get some fresh ideas and inspiration. Finally, I add in things that I know I can get inexpensively — either at Aldi or elsewhere. I’m so thankful we have the luxury of having an Aldi close by! We keep our meals simple around here, so that makes menu-planning a lot easier. I also pretty much never follow the menu plan to a tee — I’ll usually shuffle some things around, nix a recipe or two for lack of time or because I discovered another recipe that I think will work better. It might seem like a daunting task at first — especially if this is all new to you! — but don’t be overwhelmed. Do the best you can do and remember that it’s never going to be absolutely perfect. Over time, though, you’ll likely begin to realize significant savings just by taking a few extra steps and putting the effort forth to make a plan. Psst! If you don’t have the time or energy to mess with planning a menu, but you really would like to benefit from the organization and cost-savings of having a menu plan, I’d recommend checking out eMeals. Do you have some menu-planning tips & tricks to add to my list? Love the article. I have menu planning for about 1 year now it is so great to know what we are having for dinner. My husband has special food needs, so menu planning allows him to know what he can eat when. I have to calculate recipes to determine nutrition, specifically sodium…so planning ahead has reduced my stress. I agree it save times, & most of all it saves money on groceries too. I find less trips into the store has help save $$$. Crystal just wanted to say I love your blog. I started doing a weekly dinner menu plan about a year ago, and I cannot believe how much stress it has relieved! I love it! It only takes me a few minutes to do, and helps streamline the whole dinner routine. I just look in the freezer and pantry to see what I need to use up, and build a menu around these items. I also look at the weekly flyers to see what is on special. I can easily plan around family activities ( i.e. 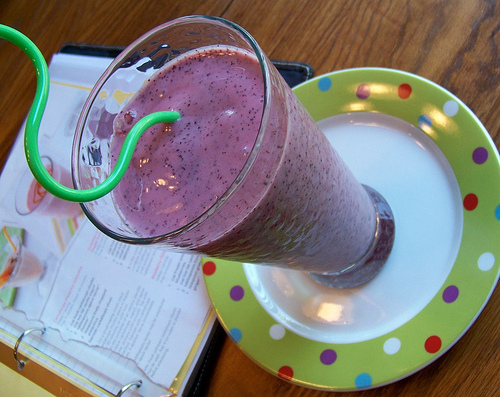 fast meals for nights we have meetings or sports practice). It also reminds me to get meat out of the freezer the night before so it can defrost in the fridge. It takes a little practice to get into the habit, but it is so worth it! My oldest daughter loves to look at the menu to see what is for dinner! I have fallen in love with Plan To Eat. I tried and tried different ways to menu plan and wasnt successful till I started with them. The weeks I don’t do a plan I always end up regretting it as I watch our bank account balance dwindle rapidly. I’ve found I feel really scattered in the store and then later in the kitchen without some type of a plan. Whenever I make something (unless its a new recipe I’m not sure about) I double or triple it to freeze. I have made the mistake of freezing and forgetting about it many times though in the past, but having a plan has definitely helped with that. I agree with you flexibility is key. Some days there just isn’t time for a particular meal I had planned, or honestly a meal just doesn’t sound appetizing or like it would hit the spot that night. I haven’t tried the pre established theme nights yet but may in the near future to see how that goes. I’m adding those breakfast cookies you posted about to next weeks plan, those look and sound delicious! I have never thought about that, but what a great idea! 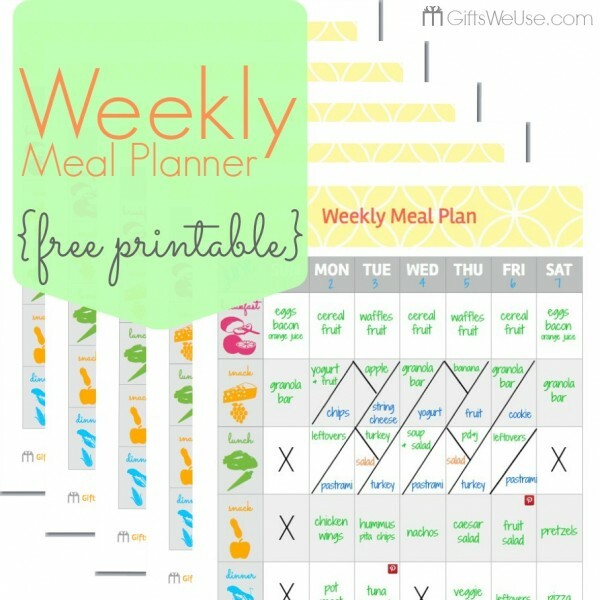 I menu plan for 6-8 weeks at a time and then do only one big shop, this saves me tons of money. 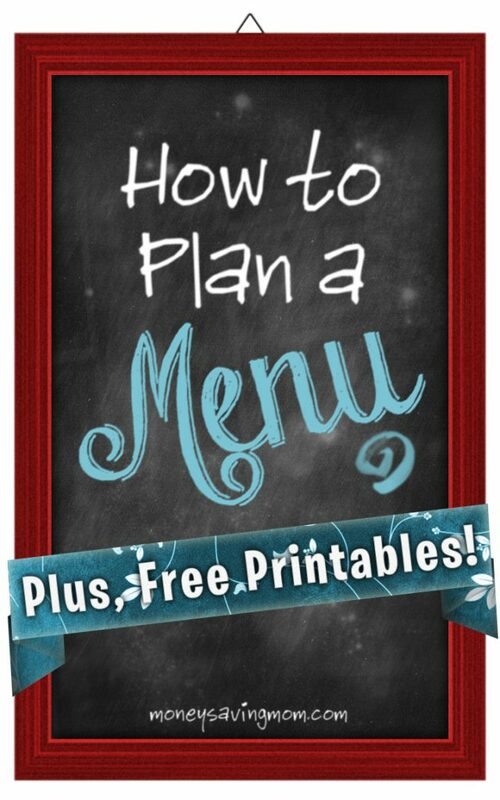 Menu planning is a huge money saver! I too do a longer term menu plan, but with our busy schedules and older kids (youngest is 14), I only have to plan dinner entrees. I just always keep breakfast & lunch items on hand-yogurt, cereal, salad, sandwich meat, etc. It has helped SO very much. I post it on a white board and have the family fill things in. I too have the theme-like menu. We are beef & chicken farmers, so there is always plenty of that, I have to make sure to include a meatless meal, a soup, and a fish meal once each week. I keep our menu simple. I plan just lunch and dinner (as we tend to eat the same breakfasts and snacks over and over). I write “lunch” followed by 7 empty lines and then “dinner” followed by 7 empty lines. I fill them in first with what we have on hand, and then things on sale. That way we don’t feel locked into eating something on a certain night yet I know I have weeks worth of meals available. I definitely can relate to that “it’s 5:00, what are we going to have for dinner?” feeling. When we get to that point, it usually means takeout, not a trip to the grocery store. I do much better when I plan a menu. Not only do I know what we’re having (and usually have all the ingredients!) but we also eat earlier and end up having a much more relaxed evening. For my menus I just use one of the strips of paper left over from when I print coupons. The ones that are 2–3″ wide are perfect for making lists. I just write the days down the side in one color and the dinners in another. I also make a note if there are special circumstances, like a meeting or activity that will require us to have an early and/or quick-and-easy meal. My empty menu for the next 10 days is hanging in my kitchen… I need to check your links for ideas to fill it in! I have menu planned for years now. It has saved me time and time again. I have a family of six, and believe me when I say that my grocery bill can escalate $100 or more beyond my budgeted amount without a plan in place. I take inventory of what proteins I have on hand. Each week, I plan 2 Beef (or pork), 2 chicken, 1 Meatless, 1 Budget, and 1 leftover meal. This takes half the guesswork for me. I now use my frugal cooking recipe books, online sources, etc to come up with menu ideas based on these categories. Then I take a sheet of notebook paper, draw a line straight down the middle of the page from top to bottom. The right side is my shopping list, the left is the menu plan for the week. I write it out in groups: dairy/fresh foods, pantry goods, etc. so that my shopping trip is easier. Lastly, I go through my coupon box (a large recipe card filebox) and attach my coupons that I’ll be using with a paper clip. Voila!! I am ready for the week, have a plan in place, and have coupons to save even more to boot. This is the number one thing I start with when a younger woman asks me to mentor them for homemaking or homeschooling. I don’t even recommend it for financial reasons. They are usually asking for help because of stress issues and menu planning is the biggest stress reliever I have found for Moms. I have planned my menus on a wall calendar for more than 10 years. I started doing this so that the now grown children could check the calendar instead of asking me a dozen times everyday what we were having for supper. If I do not use a meal I circle it. Those circled meals move forward when I make more plans. It is so easy to look back at previous months for ideas too. If I try a new recipe and we do not like it then I note that on the calendar. I only plan suppers. Breakfast is always the same on the same days for us and lunch is whatever needs to be eaten. I had been menu-planning for quite some time until my husband decided he wanted to go almost exclusively vegetarian. My young daughter and I are NOT vegetarians, and I am now faced with having to plan/prepare 2 dinners every evening. Any suggestions on how I can streamline this process? It’s gotten me way off track and I’m feeling discouraged. I used to have to cook 2 meals most nights because of food allergies. Most of the time sides, salads and breads can overlap so all you are really dealing with is the main dish. It is helpful to have a stash of main dishes in the freezer so that you are not starting from scratch every night. Since your husband is eating vegetarian and cooking for one is tough I would freeze his main dishes in portions that can be reheated. I did a lot of that for our one who ate differently than the rest of the family and it really helps. Sometimes one main dish can just be altered slightly to accommodate, too. You can make pizza night be a half veggie pizza and half with meat. Or if you were doing stir fry you could do all the veggies and then scoop out his portion and stir in meat with the rest. It will get easier as the weeks go on and you get used to it so all is not lost on the menu planning front! Like Lana, I used to do two meals because of food allergies – or rather, two versions of almost every dish. Butter in the main bowl of mashed potatoes, and olive oil in other, for example. It was so much extra work, time, and dishes, and it really wasn’t necessary. First, consider how many dishes will overlap. That should be most, if not all sides. That leaves just the main dish. I’m repeating what Lana said again, but many main dishes can have the meat added later, after setting some aside for your husband. Now, for the “meat” of the question. Do you feel like you have to have meat at every single meal? If so, why? Lots of non-vegetarians are adding at least one meatless dinner a night, for both financial and health reasons. If you chose to have two meatless nights, that’s over 100 nights a year when you don’t have to make two versions of anything. Then consider adding at least one another night when the meat is completely on the side – like grilled steak or chicken. I know of vegetarians who typically do this for their meat eating husbands. They keep a few simple proteins in the fridge each week, and add them on the side to a vegetarian meal to satisfy the craving. I’m a meat-eater through and through, so I understand not wanting to give it up, but that doesn’t mean there isn’t a place to meet in the middle. Mon: soup – we grill/bake a bunch of chicken and then freeze it in single serving sizes. I have the meat and cheese on the side for those who want it but the soup itself is vegan. I have enough soup recipes to last about 8-10 weeks and more to experiment 🙂 So it never becomes repetitive. Tues: slow cooker/chili – I portion cooked hamburger meat in serving sizes and freeze. The main chili / baked beans is vegan then I add the hamburger meat to individual bowls. Again cheese and sour cream on the side. With the baked beans, I make homemade buns, which are naturally vegan (before being slathered with butter, however 😉 . Wed: rice/pasta – usually a vegetable stirfry with the rice. Warm/cook and add chicken/shrimp/beef afterwards. I also make the stirfry sauce on the side (usually a very quick peanut sauce). Pasta is usually penne/rotini and vegetables. Again warm and add the meat afterwards. I also buy a chunk of parmesan cheese, grate it and keep it frozen. Great for topping pasta dishes at the table. Fri: burgers – I have great recipes for black bean burgers, chick pea burgers and then there’s portobello mushroom burgers for a treat. I premake hamburger meat burgers, grill them on the BBQ and freeze. We usually have our burger night with either baked French fries or a pasta salad if I have more time. I’ve tried to keep my menu plan as simple as possible (although I’ve written with a lot of details!) Hope this helps! Wow! Thank you for listing your menu! I’ve started a grain-free diet due to health reasons, but others in my family cannot handle too much protein so it’s been a struggle, a very expensive struggle. With some tweaking, I can definitely use most of these suggestions. We have found that with a menu plan we eat a lot healthier. I keep a list of freezer items posted on the fridge and each Sunday morning we sit down together and discuss what we would like on the menu for the week. There are weeks we stick to it like glue and others where “life” happens and the menu plan flies out the window. I try to fit in at least 1 new recipe a week to keep things interesting. An open night is always good too. My sophomore year college daughter is living off campus this year with 4 other girlfriends. Talk about menu planning on a broke college student budget! Sent her off last week with a print out of Crystal’s $25 a week menu plan, and just nowI copy/pasted the Tsh plan into an email for her. You are so very welcome and you sound like such a great mom! I chuckled when you said that Aldi was a luxury. 🙂 I realize you said that having it close by is a luxury, & I totally agree, but I bet Aldi & luxury have rarely been in the same sentence–except maybe to state that someone is cutting out luxuries & will now be shopping at Aldi. Just made me smile, that’s all. 🙂 I love that I can always count on low prices and that there aren’t many choices — it truly simplifies things! Well, it may be a luxury to someone who has used food from food banks…:( I work with people in this situation everyday. It’s sad, so I have to count my blessings. I do emeals… some of you know what that is. It’s a subscription (fee) meal planning service that does it all for you. If anyone out there is like me, menu planning causes more stress than it alleviates. Some of us, for a variety of reasons, just are not good at menu planning no matter how much time and effort is put in. For several years I have beat myself up about it and tried and caused myself so much anxiety. For me it’s personality as well as life experience. Because of being brought up in a chaotic home where meals weren’t even offered let alone cooked or planned, it will probably always be unnatural for me. So don’t feel bad if you’re like me. We are a lower income family and yes, emeals costs money, but if I plan my own meals, it always ends up costing more, and then I feel like a failure and wonder if we should eat plain beans every day but that gets old fast. I may be odd in how difficult meal planning is for me, but I just wanted to encourage anyone else who is like me. I don’t use any kind of worksheet–honestly, I keep the pieces of paper that are left when I cut out printable coupons and I write my grocery list(s) and meal plan on those scrap papers! My husband and I have planned meals together since we started living together! It has become part of our bi-weekly routine. After looking at our schedules, the current ads, coupons, and Pinterest, it takes less than 10 minutes to crank out a 2-week meal plan. We live in a very rural area and are only able get groceries once every 2 weeks. That kind of forces us to plan ahead! Our New Years’ Resolution was to add a new meal every time we meal-plan so we don’t get stuck in ruts. Maybe we’ll build ourselves up to do an entire month soon! We’re in a dinner rut because we’re all so picky. Not sure how to get us out of it, but I know it does help when we have a plan…the problem is it’s the same stuff over and over! With little kids, I find it really hard to carve out time to meal plan every week. So I planned out 8 weeks worth of meals, and just plan on repeating them! I’m on week two and so far it’s working great! I have started planning my menu on a Google calendar- it is so easy and organized! I create a calendar titled “Supper” and shared it with my husband. We rarely plan our lunches unless it is a Saturday or Sunday but I also created a “Lunch” calendar that shows up in a separate color for when we need it. I just create an “event” for every day of the month with the title being our meal for the day. If it is a meal that I need a recipe for, I can easily copy and paste the url into the description box or note what cookbook it is in. What I really love about it is how easy it is to move around the meals as needed- just click and drag the meals around to different days if something changes! My husband loves being able to pull up the calendar at work and know what we are having for dinner! We both have an app on our phone that allows us to see our google calendars, so we have access to our menu plan anywhere we are- very convient, easy, and free! I used to menu plan every 2 weeks and tried to shop every 2 weeks. It always stressed me out to make my grocery list before each trip. It would be so huge, I hated getting on Pinterest and going through my cookbooks to see what I need. I did menu plan based on sales. I just stockpile things. This summer I went to doing a monthly menu plan, and I love it! I only get out my cookbook 1 time per month and I make a list on the back of my menu of week I need each week. Then I am grocery shopping weekly. It has really alleviated a lot of stress for me. I have started planning monthly for dinners. I think it is more economical for our family of 3. I mostly use what I already have on hand in the pantry or freezer, buy what is in season for fruit and veggie sides, and then stockpile based on the sales and coupons. That will be the basis for my next month’s plan. Now that our baby is eating more and more finger foods, I do need to meal plan her breakfasts and lunches. I know it is better for her to eat a variety rather than the same Cheerios and banana slices each morning! Wow Crystal! Thanks for featuring my meal planner here! I love your site and am blushing with giddiness that you chose to share my free printable with your awesome readers!!! Hope this printable can get moms planning and saving time and money! Thanks so much for sharing such a great printable! When I saw it online, I knew I had to share it with my readers!